If you’re looking to get one of the largest tablets out there, congratulations because you’re making a great decision. And even though the largest tablets can be very useful, it can be a bit hard to find the best large screen tablet for your needs. Another great thing about some of the best and the largest tablets on the market is their versatility. They can even be used as 2-in-1 tablets and be used to replace your old laptop permanently. And you’re in the right place, because, in this post, we have spent hours searching and testing a number of different tablets in order to come up with 5 best large screen tablets in this year. Therefore, down below, you can see our top picks, the reasons we chose them with our opinion, and a reason why exactly you should go with one of the tablets down below. The latest iPad Pro comes with the best display so far which makes it the best large screen tablet. In combination with an amazing design, powerful performance, and a long-lasting battery, it can’t get any better than this, making this tablet worth every dollar it costs. The latest iPad Pro is all new, from the design and configuration to the screen, and that’s what makes it so perfect. Apple has invented and introduced a new edge-to-edge display type which is a Liquid Retina display that even comes with additional technologies to improve the efficiency and put an eye to the smallest detail. This type of screen is the most advanced technology ever released from Apple, and if you’ve tried the iPad Pro, you’d know within a minute why it’s so amazing, and why everyone talks about it so much. You can think of the latest iPad Pro as a piece of glass that offers a magical view and does everything you want it to do. To make sure users get the best of the best when it comes to the best tablets with a large display, they’ve conquered the market with the most powerful and the smartest chip ever invented – the A12X Bionic. It’s a chip based on a Neutral Engine and it can run up to five trillion operations per second, which is amazing – enabling machine advanced learning. Along with such a powerful processing chip, there’s 128 GB of storage which is more than enough and requires no further upgrades, and a 4 GB of RAM. With such powerful components, multitasking is faster than ever it has been, requiring just a few swipes to achieve your goals. 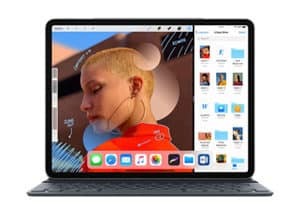 Along with some of the latest technology Apple has used in the latest iPad Pro, there is a bunch of other features that make this tablet just way better – fulfilling every need and wish users have. iPad Pro is compatible with an Apple Pencil (2nd generation), and not only it provides an amazing experience (which is something every digital graphic designer should check out), the Apple Pencil even responds to your touch! Multitasking has never been easier and getting work done will take less time than ever before. 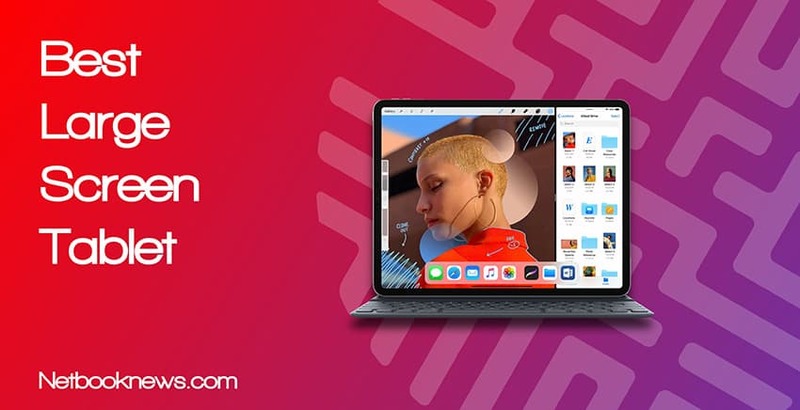 Along with Apple Pencil, users get the opportunity to connect iPad Pro with a Smart Keyboard Folio that will turn your tablet into a very portable and powerful laptop. 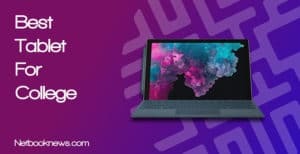 If you’re looking to absolutely replace your computer or laptop, Microsoft Surface Pro 6 is the right choice. It’s the most versatile tablet with a large display and it can do almost anything with the help of its Surface Pro Type cover. 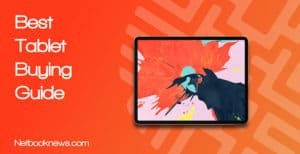 Even though Surface Pro 6 is an amazing tablet, a huge credit still goes to its Surface Pro Type cover which can’t wouldn’t be anything special without the tablet. Therefore, they go so well, hand in hand. 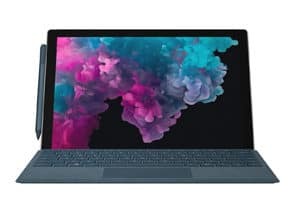 As the Surface Pro 6 is an upgrade in whole, so is the Surface Pro Type cover. The most improvements were made on a design and what we really liked was the slight spread in the keys which make the keyboard a lot more enjoyable and suitable for larger hands. With even better improvements than ever before, Surface Pro 6 will feel like a laptop – but only when you need it to. The combination of such powerful tablet with a cover that allows you to take anywhere and keep it protected is awesome, but there’s so much more. Surface Pro 6 is extremely thin and lightweight, yet sturdy due to the durable metal chassis and wise choice of material by Microsoft. Not only this tablet is travel-friendly, but you won’t have a single worry in the back of your mind as you take it with you wherever you go. You can use it either as a tablet or as a laptop replacement and do work in places you have never thought about taking your laptop. Or maybe taking it out of your bag and doing some work on a train station while you wait – the choice is endless. Even though this tablet is very thin and weighs less than two pounds, we were really surprised to see Microsoft was able to fit some of the latest configurations inside, and still make it go well with the overall design. Therefore, you will be able to throw the most demanding tasks at this tablet and you’ll get only the best and the fastest results. Microsoft Surface Pro 6 is powered with the latest 8th generation of Intel Core i5 processor, along with 8 GB of RAM and 256 GB of storage. This configuration is even more powerful than some of the laptops or computers out there, and such power is even more valuable when it comes in a compact style. 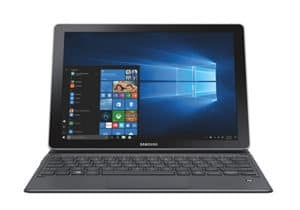 Samsung Galaxy Book is one of the best Windows tablets and is equipped with powerful components that make the performance a breeze. 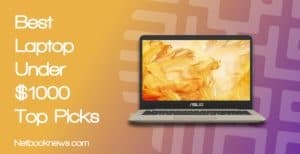 It can handle almost anything your computer or laptop could, and plus much more – anywhere you take it. If you’re looking for a powerful Windows tablet and aren’t digging the Surface Pro 6, Samsung Galaxy Book is the next best choice. It’s a tablet designed for performance, along with being versatile, portable, and travel-friendly. Samsung Galaxy Book is equipped with the 7th generation of Intel Core i5 processor, 4 GB of RAM, and 128 GB of storage. We should also mention that the storage is upgradeable if users ever decide they need more space, which is pretty useful to have. Two USB-C ports are wisely placed and will allow you to connect all your devices without a single problem. Another great innovation from Samsung is the Samsung Flow that is created in order to connect all your Samsung devices seamlessly. The best thing about Samsung Flow is that you can use it even without WiFi connection to keep your devices connected at all times. That’s just one of many main features that make this portable & powerful tablet even more significant. We loved how simple it is to share, receive, and respond to notifications from a third party and native apps through Samsung Flow. You can even respond to notifications without WiFi and they’ll get sorted out the moment you get online. Other than being packed up with the latest configuration that provides lightning quick speed during the use, this tablet is also lightning quick when it comes to charging the battery. We’ve got around 11 hours on a single full charge cycle of regular use, which means entertainment, apps, and video play time. If you use a tablet for less, you’ll probably be able to get a bit more life and vice versa. However, when you fully drain your battery, there’s nothing to worry about, thanks to the innovative Adaptive Fast Charging feature. To get the Galaxy Book’s battery fully charged, it takes less than 3 hours. That’s ideal when you consider you can push through all day on a single charge, have your rest while you charge it back and then get ready to continue. When you aren’t looking to get the biggest there is, yet you’re looking for a still powerful tablet – iPad Pro 11″ is a perfect size. It features an amazingly beautiful display, along with a powerful configuration that can handle anything and a stylish & durable design. Even though iPad Pro features the latest design that is the thinnest tablet Apple has ever released on the market, it’s amazing to see they were still able to fit 4 speakers. These 4 speakers work in combination to create a wider stereo sound that makes the audio quality just perfect for watching movies, TV shows, listening to music, and even playing games. This is great for people who aren’t solely relying on headphones to get that perfect stereo sound, yet would love to just chill back, relax, and enjoy the audio directly from the tablet. What we have noticed is that the speakers are also wisely placed so you get the best experience at all sides, including the front – which is always important. iPad Pro has one of the best 11″ displays among other tablets on the market. It features the latest Liquid Retina display that offers absolutely breathtaking views. However, it even features additional features such as ProMotion, True Tone, and Wide Color, that additionally improve the screen quality. 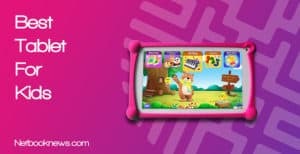 Playing games or watching movies might even seem better on your tablet than on your laptop, or definitely some older TV. We’ve even tested the 12 MP camera for video calls and the quality of video calls was surprisingly good. This tablet is one of the thinnest tablets Apple has ever made, and even though it’s super-thin and weighs just under a pound – it still comes with a solid battery that offers a long-lasting life. On a single charge, you can expect to get approximately 10 hours of regular use, which includes web surfing, using WiFi, watching videos, listening to music and such activities. However, some heavy use could result in shorter battery life. If you decide to surf the web using the 4G connection, battery life will be a bit shorter, approximately 9 hours on a single charge. On a good side, charging takes somewhere between 2 to 3 hours which is super-quick, considering one fully charged cycle can last you a day. When you’re looking for a tablet large enough to replace your laptop, yet that comes with everything necessary included in the price, there’s no better choice than this tablet. It’s powerful, versatile, and stylish. 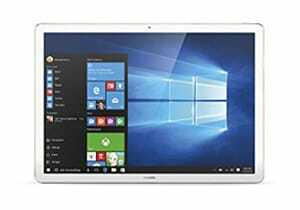 Huawei Matebook E Signature comes with a 2K display that reaches a resolution of up to 2160 x 1440, and it offers 84% screen-to-body ratio which is something you want to get if you’re into movies. Along with narrow bezels that provide exceptional visual experience, there’s not much you can ask for since this tablet comes with a sharp and bright display that will adapt to your eyes depending on the ambient, anytime. This tablet is equipped with the 7th generation of Intel Core M3 processor that provides an outstanding smooth experience and performance in combination with a great display. Combined with 4 GB of RAM, there is no task it can’t handle. This tablet can easily replace your laptop, no matter if you’re looking to get your work done on a go or simply have easier access to your entertainment. What we really liked about this tablet is that the Folio keyboard comes included with the tablet and is included in the price. It’s a detachable keyboard that will turn your tablet into a 2-in-1 tablet/laptop within just seconds. However, even though it’s detachable, don’t mistaken it for a small keyboard. It’s a full-size keyboard which even has its own backlit chiclet that is comfortable and offers a positive typing experience. We’re talking about the largest tablets out there, which means you most of them will come with a better display and a great resolution. Paying attention to the size and resolution of a tablet will allow you to easily get the best viewing experience. Even though all bigger tablets come with a bigger screen, that doesn’t necessarily mean that they will come with a quality display. In order to determine whether a display is satisfying enough, you’ll need to pay attention to the size and resolution of a tablet. Resolution is one of the ways that will give you a clear idea whether the display in question is worth the value of the tablet and if it’s going to provide an amazing viewing experience everyone expects. It’s kind of hard to determine the quality of a screen at first, but help yourself with specifications is just a great advantage. With larger tablets, you have the possibility to enjoy the screen much more than you would with a smaller tablet, including a number of gestures or even pen for tablets. Finding a tablet with a great screen that is has a very responsive touch is as important as configuration and performance are. Touchpad can either make or break your tablet experience, and even if all specifications are proving that the tablet is a great one, touchpad might be the actual thing that will slow you down. If it doesn’t slow you down, it might not be as good as you thought it is for various activities such as graphic design work using an additional pen. Paying the attention to the touch capacity of each tablet will show you a clear estimate on how good is a touchpad in a tablet. 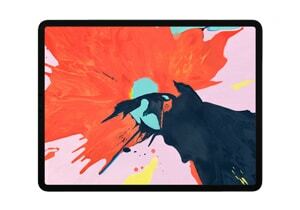 A quality touchpad offers more gestures as well. Larger tablets come with larger screens, and believe it or not, they might be more fragile than smaller tablets. Making sure you not only like the tablet visually, but that the tablet is built using a great material and is designed in a way to provide great self-protection, you’ll spend less time worrying about it. What’s the worst thing that can happen to your new tablet? Cracked screen, among other things, right? Not only design and form is important for the functionality and determining the way users will be able to use the tablet, but it’s also important to provide a great cover for the powerful components located inside the tablet itself. Adding a case might solve half your worries, but getting a tablet that is built using very robust materials such as steel or robust plastic will keep you safer in a long run. It would be a pity not to use the advantage of a large tablet that can easily replace any older computers. By finding a tablet that comes with one of the latest configurations to provide the best performance and experience, whatever it is you’re expecting to get from a tablet. It’s pretty fascinating how such powerful components can fit inside thin and lightweight tablets nowadays. Make sure to use it to your advantage and get a tablet that’s packed with the best of the best. It will allow you to do much more than simply taking care of your current needs, and will last you for as many years from today. 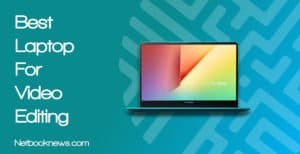 By getting a tablet with one of the best performance available on the market nowadays, you might even be able to replace your laptop computer with a more versatile and portable option. Battery life might not be in your first plan right now, but you better make sure to get a battery that can last for as many hours on a single charge as possible. This way, you won’t be slowed down and have to carry a charger anywhere you go. Even though the tablets come with more powerful configuration, more demanding displays, and a thinner and lighter body, we are still lucky to get as powerful batteries we have nowadays. On average, a battery of a large tablet can last up to 10 hours, and that’s exactly what you should aim for, without settling for anything less. Another great thing is that batteries nowadays can be charged even under an hour, and yet last up to many hours in a row of regular use – which is a brilliant thing to have when you’re traveling or trying to stay online on a trip.